I am in winter mode right now, running 16" steelies with snow tires because Canada. But I have mounted my BBK on the front for a mock up and I want to say I'm the first B17 guy to do it. Everything works but I can't run the setup with anything less than 18s, so I'm running stock brakes through the winter and I'll switch back to the BBK in the spring when it's time for summer tires. 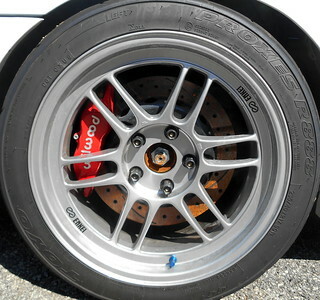 Setup is 4 piston calipers and 14" rotors. 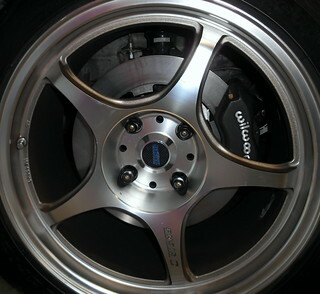 They are factory 370Z and various Infiniti rotors and calipers. 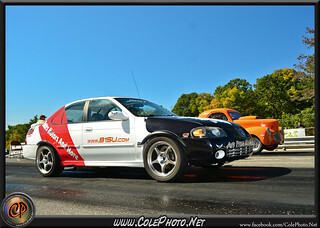 Anyway, heres a couple pics. Rears will be ordered soon. that's something I wondered about on a lot of our car, what parts are interchangeable from other vehicles. when you get some time can you get a parts list of what you used from what vehicles? If this is something that we can just get from a local parts store that'd be amazing. looks like I'll be updating my Christmas list. Words of the day: but... Did it work? 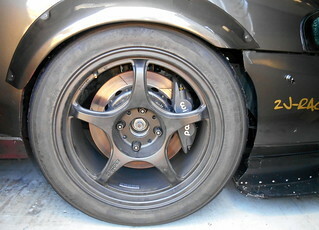 I used 370z calipers, 370z rotors, and z1 motorsports banjo bolts which are 5mm shorter than stock. The only thing special is that I have a 5mm spacer behind the rotor, that centres it in the caliper and pushes the rotor away from the dust shield as well. There's a guy who goes by Nissanegg on the Juke forums. That's where I got my inspiration. So first post in awhile. Moved over 5000kms across the country and now I have a big garage and some decent funds for doing cool stuff. 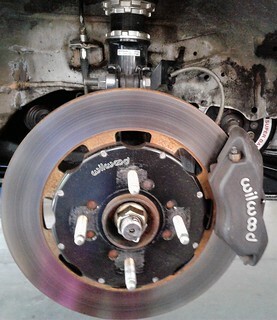 Bought the rear 370z calipers and rotors, mocked them up. They work perfectly as far as fitment goes and the parking brake working. Currently waiting on rear pads to come in mail so I can bolt my BBK on to the car. I could do the fronts for now but I'd rather just do all 4 corners at once. I also removed the bottom torque mount and filled that with windshield adhesive urethane, which is a pretty common DIY solid motor mount substance if you're unfamiliar with it. Also installed some RokBlokz mud flaps, black with blue logos. I have an Injen 3" cat back waiting to be installed as well but I'm waiting until I pass an out of province inspection and get Alberta plates on the car. Pretty sure it will fail with an aftermarket exhaust. So I'm just not risking having to install the stock one back on to do the inspection. If anyone is wondering what needs to be done to the rear dust shields to fit the rotors, you need to trim a small section around the caliper. And then the whole outter ring needs to come off the dust shield so the rotor will sit on the hub without rubbing the dust shield. Basically cut along the yellow lines I very crudely marked out here.